The town of Zamora was our last stop in Spain before heading through the mountains to Braganca in Northern Portugal. It didn’t turn out to be very exciting, although we did enjoy a huge ice cream there when we walked into town to find out if there was anything worth seeing. To be fair to Zamora, it is perfectly possible that we missed out on some wonderfully interesting places. If we did, they are well hidden. All was not lost as we enjoyed another free night on the side of a lovely park with proper pitches for individual motorhomes. The dogs pronounced it ideal and we were able to do some people watching from the comfort of our lounge window. We were surprised to see a lot of elderly people turning up later on in the afternoon and sitting in heavy coats on park benches. Perhaps they were simply taking the air or maybe hiding from younger members of the family who had just been let out from school. They seemed cheery enough if a little blue around the edges as the temperatures plummeted at sunset. Once again it was freezing cold overnight and Poppy was crying at 5.30 a.m. We have a wonderful thick fleece over-blanket, that covers us up completely, so we’re often not aware that the temperature in the van has fallen to just over freezing. Putting the gas heating on overnight is something we’ve never been keen to do, so unless we’re on electric hookup, the cold is inevitable. Shirley, inspired by the desire not to be woken up by a miserable pup, finished Poppy’s jumper the following evening and she has slept in it ever since. What a difference! Peace and quiet until eight in the morning. Heading into Portugal from Zamora was breathtaking. The road is excellent and almost deserted. 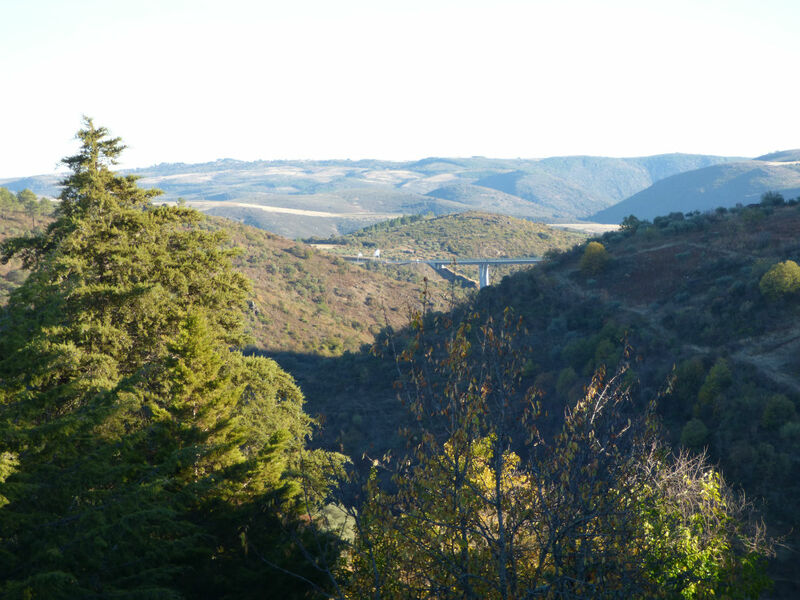 We passed through an occasional small town followed by miles of wide open spaces with mountain views as we entered the Transmontana region of Portugal. Braganca is high up in the mountains in the North East of Portugal and our visit there didn’t start well. We had been using so much gas from our refillable Gaslow system that we felt sure that we urgently needed to refill it, so we followed the coordinates for an LPG (GPL) station in Braganca before heading to the motorhome parking area. The satnav cheerfully announced that we had reached our destination but the promised GPL garage was nowhere to be seen and Shirley manoeuvred us round and round until we gave up and decided to risk running out of gas. Off we went to the parking place, discovering very quickly that the satnav was constantly a beat behind our position and we found ourselves missing turning after turning. Eventually, just before Shirley drove out of the town in disgust, we hit on the idea of following the signs to the castle because we’d read that the motorhome parking was right beside it. Two minutes later we found it and we are so glad that we did. Parking up on the slightly sloping motorhome area, after filling up with water at the free services, we set off to find some lunch. Just down the road was a café/restaurant called the Royal Plaza. The name was definitely more upmarket than the café but it was clean and open and we were hungry. Going in, we asked the man who met us at the door if he spoke English and he shook his head but used sign language to ask if we wanted to eat. We nodded and smiled and were led to a table where he left us. He seemed gruff at first and we wondered what would happen next. Portuguese is a language that looks like Spanish written down but sounds like Russian. We had no hope at all of understanding the man so we decided to just eat whatever he offered us. Returning to the table he asked “Parlez vous Francais?” – how relieved were we? From then it was all plain sailing. He asked us if we would like soup, chicken and chips and a bottle of beer. To be honest we would have accepted anything as it was now two in the afternoon and we had eaten nothing all day. The food and cold beer arrived and it was surprisingly good. The chicken and chips came on a big platter and it seemed to be a whole chicken chopped into quarters and roasted in herbs. We had no hope of eating all the chips and rice that came with it but we made a very brave attempt. After this came fresh fruit salad and coffee and we could barely move. Going up to the counter to pay we discovered that the three courses, beer and coffee came to 8.50€ each. We left the change from the 20€ note we paid with, feeling almost embarrassed to have been so well fed for so little money. The gruff man who had met us was all smiles and good cheer as we left, much like ourselves as we rolled back to the van. The motorhome parking at Braganca is set in a park on the top of a steep hill with the castle immediately above the parking area. We explored inside the castle walls and found more cafés and restaurants and a couple of craft shops. The grounds around the castle walls give incredible views up into the hills and mountains and over the town. There was something quite magical about it up there, so high above the town. The air was sparkling clear and warm in the afternoon sun and we decided immediately that we wanted to stay longer than just one night so we agreed that we would do just that if we could find somewhere within walking distance to buy food. We normally only shop for one or two days at a time and the fridge was looking a bit bare. The next morning, after tiring the dogs out on the steep slopes of the castle gardens, we set off in the vague direction of the town, basing our route on what we could see from the castle. Finding our way to places on foot is an interesting process where my reasonably good sense of direction mixed with a desire to get to where we’re going as efficiently as possible, meets Shirley’s sense of adventure and frankly, total lack of a sense of direction. With these challenges, we try to work together in some sort of harmony. Off we set down the road, past the Royal Plaza café and towards the town. As we turned a corner Shirley saw a sign that said Mercado (market). “Let’s go that way!” she cried, so we did. Halfway up the hill she saw another sign, “Centro”. “Maybe we should go that way,” she said so we turned left. I tried to point out that the signs were for cars and it might be a good idea to just follow the direction of the shops based on our view from the top of the hill but by then neither of us knew where the hell we were so we ploughed on. After a brief diversion into an ironmongers shop, we found ourselves in the town square and in need of refreshment of the caffeine based variety. We entered a slightly sleazy looking coffee shop and had a moment of deja vu. We were met by a gruff gentleman who spoke no English. As if by magic he asked us if we spoke French, asked if we wanted coffee and showed us to a table. We remembered to ask them to bring a long coffee with hot water in it, á la Americano, as we’d tried a short shot of after dinner coffee the day before and our brain cells had only just come down out of orbit. We drank our coffee and Shirley began to talk. Before I tell you what she said you need to understand something of the way her mind works. Shirley should definitely be a novelist. She makes up stories about people we meet and incidents we witness until they begin to sound like facts. “Did you see the three men all dressed in black?” she asked mysteriously. Straight away I imagined that there was a Portuguese version of the mafia and Shirley had seen them involved in some nefarious activity. “I think they were going to a funeral.” she went on. Ah – the dressed in black bit began to make sense. “Did you see the drunk man they were trying to get to sit down and drink coffee?” she went on. I agreed that I had indeed seen the drunk man, which is why we had avoided that coffee shop and come to this one. “I think the funeral was for someone special to him and he had taken to drink to cope with the grief.” I pointed out that the drunk man was wearing a bright blue and red jogging suit so he was unlikely to be going to a funeral. “Maybe he was so upset he couldn’t even think what to wear to the funeral.” Shirley went on, intent on making her fantasy into reality. “Shirley,” I pointed out tactfully, “A lot of people seem to wear black in Portugal.” We sat in that odd little coffee shop laughing until we cried. No doubt the elderly Portuguese couple sitting next to us and glancing suspiciously our way were making up a story about the ridiculously brightly clothed British women sitting next to them. Not content with the outcome, Shirley found further evidence to support her story. All the tables in half of the café were set ready for a meal. “There you go,” she said, triumphantly, “they’re getting ready for the meal after the funeral.” We laughed some more and got ready to leave but not before I’d noticed the cook in the kitchen, stirring massive pots of soup and occasionally dipping her little finger in to taste it. Coming out into the street we meandered up the hill towards the market square and found, to our delight, a proper open-air market with local produce being sold on a variety of makeshift tables. We were searching for olives and eventually found a stall selling them out of massive buckets. The person in front of us bought 3 kilos of them so when it was our turn we indicated that we wanted only one scoop. The man behind the counter asked if we were French – we said “No Inglés” and he smiled delightedly. He then measured out half a kilo of mixed olives and I offered him a handful of change. He took one Euro and waved away the rest. As we left he called “Bye bye Inglés” grinning happily. As we walked down the hill away from the market we met an older lady who began talking to us in Portuguese. We waited for a gap in the flow of unintelligible consonants and said that we were English speakers. “Do you speak French?” she asked and we gave the standard “Un petit peu” answer. She then switched seamlessly into French and asked us where the market was. We directed her up the hill and to the left and walked on feeling very puzzled. How come so many people spoke French here? At the next corner, we hit jackpot. We found a Lidl! In we went, filling our basket with food for a couple of days and feeling as though we had come home. Lidl’s everywhere have the same smell, most of the same produce and a similar mixture of weird and wonderful objects amongst the great value food. Standing in the queue at the checkout a man behind us asked if we were English. We only understood the word English but realised what he was asking. He spoke no English but had a few words of French so we stood there having a strange conversation based largely on sign language and learned that he had been in a hospital near London and had been given injections in his bottom. We giggled together like kids until it was our turn to pay and leave. Turning around he was still there at the check out waving and laughing. We turned for home with our backpacks full of good food and a spring in our step and as we came to the bottom of the town square I turned to Shirley and fixed her with my best firm look. “I’m in charge on the way home ok? No diversions, no suggestions. I’m hungry and I need a wee.” Off we marched up the hill towards the castle. Every now and again Shirley stopped and said, “Look, there’s a …” and I gave her the look and marched on. The most direct route turned out to be very steep and cobbled but I wasn’t going to admit that the way we’d come was easier. At the top of the hill, we bumped into a young man we’d chatted to the day before outside the restaurant at the castle. Speaking perfect English he offered us a discount leaflet for the restaurant and made sure that we understood that there was no pressure. As we talked, we asked him about the number of people we had met who spoke French. He explained that a lot of local families had either worked in France or had members of the family who had worked there. France had become almost a second language to the town. Back in the van, we looked at the leaflet. A six-course dinner cooked by a finalist of Master Chef Portugal including cocktails, wine, liqueur & coffee was on offer for 20€ a head. We hesitated for about thirty seconds and then made our decision. Later that night we strolled up the cobbled path to the castle and were met by Paul, our young friend at the restaurant. We were given personal and attentive service, starting with a cocktail made from white port, tonic and apple followed by dish after dish of local delights. The chef popped in and out of the kitchen to smile at us and check that we were enjoying everything. Paul explained that he was an economics graduate and had done some of his training in Australia. He was working in the restaurant for a few weeks before going to London to take up a contract he had been offered there. He told us that he had worked at the restaurant as a student and had helped the management come up with some interesting ideas to build the business. This tasting dinner that he had invited us to try was one of his ideas and it was an obvious success. Each dish was brought to the table with an explanation of how it was made, the local produce that was used to create it and little interesting facts about Portuguese culture. It was a wonderful evening, although a six-course meal was really far too much for us to eat and I lay in bed that night groaning and swearing I would never eat again. There is no doubt – it’s the people you meet that make a trip like this so special. I’m adding Braganca to my list now, thank you. Shopping in the markets can be daunting but we’ve had some interesting finds and freebies. We are in Abruzzo and they give us sticks of parsley and celery for free and in France the fishmonger gave us a lemon and parsley. We love markets – sometimes they feel a bit scary when crowds of local Mammas are buying food and tussling for a place but they are so entertaining. I’ve just looked Abruzzo up – it looks pretty special too. So many places to see! We found a great place not far from Spanish border at Reguengos. There is a superb restaurant at the Herdendos de Esporao wine estate. Michelin 3 * quality. After eating a 5 course lunch with appropriate wines we moved on to Mongaraz nearby from where you can see across the border into Spain. An ancient Template Hill town with castle and parking for vans. We loved the whole day – food, drink, history and views. And yet another lovely place for us to explore! Thanks for the heads up – we’ll put it on the must-visit list. Thank you! Fantastic blog as usual Mags. Pleased your having a great time. Happy travels to you both and hope to meet up one day. Thank you, Mike. It would be good to meet up sometime. We’ve just met a bunch of British motorhomers and it’s great to swap stories. Ditto above. And can I put my order in for a set of Shirley’s knitted pjs? I have my thermals out! I’d go on all fours, if my still bruised knees would allow! Braganca looks lovely. Our son was hoping to do his MA there this year and we were planning on lots of visits but it sadly didn’t happen. It is still on our list and looking at your blog we will definitely stop over for more than a night on our way to Porto. You certainly seem to be having a wonderful time . I’m adding Braganca to my list now too, have been saving your bloggs so, hopefully, one day we too can share some of your wonderful experiences. We’re loving visiting places we’d never heard of before we left. Exploring is great fun! Hope you get to do some of it before too long David. I am so glad that I am not the only person to make up stories about random people. It is one of the best things about motorhoming, sitting people watching and inventing little stories. I love reading your stories, keep up the good work. It’s all part of the fun – harmless and entertaining. Thanks for your kind words – blogging is another part of our fun and when we’re back at home we can look back and see all the wonderful places we’ve been and read all the comments. Fabulous.